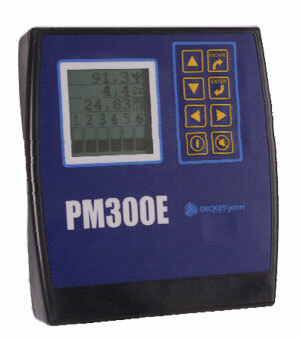 The DICKEY-john PM 300 E and PM 332 seeding monitoring monitors are indispensable for every precision seeding such as corn, sunflower, beet, etc ... when each seed is important. They always guarantee the regular descent of the seeds in the ground and the perfect operation of the seeder. With their photocells, mounted on each row of the seeder, they immediately warn the operator of any anomaly or an abnormal interruption of the descent of the seeds. 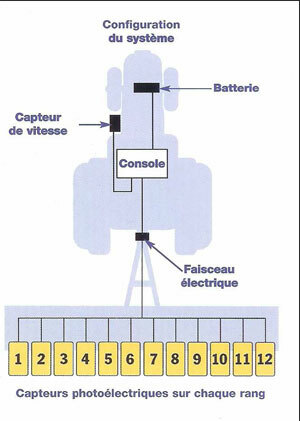 The monitor, positioned near the operator, constantly controls the seeding. Displays the feed rate and calculates the machined surface by displaying it on two independent totalizers. Seed monitors PM 300 E and PM 332 constantly monitor for you that the seeds actually fall one by one in the ground and warn you immediately if any anomaly in the seed occurs. They also detect any abnormal decrease or increase in the fall of seeds that occurs in one or more rows of the seeder: decrease in suction, start of seedlessness, badly regulated ejector, partially obstructed falchione .... and report it immediately to the operator. The PM 300 E and PM 332 seeding monitors also measure the feed rate by means of a magnetic sensor mounted on the seed drill or the radar mounted on the tractor. The radar measures the speed with respect to the ground thus eliminating the errors due to slippage.